Chosen to ideally suit the sit/stool/stand adjustment levels of Biomorph desks, HAG Capisco stimulates intuitive and natural movement of the body and variation of sitting postures leading to improved health and productivity. 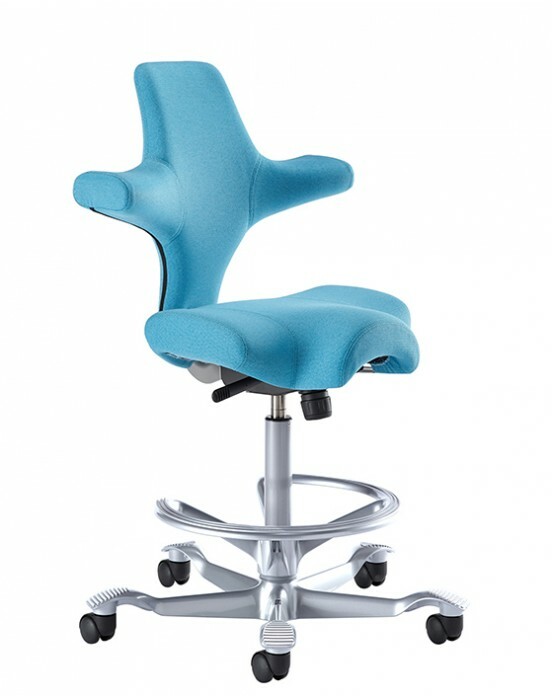 • Made for greater freedom of movement, variation and natural sitting positions • Gives you an upright sitting posture and a natural curvature in you lower back • Makes it easy to sit actively with a semi-standing position • Perfect for shifting between sitting and standing with a height-adjustable Biomorph desk • Standard seat height, seat depth, back height adjustment with backward tilt tension and lockable tilt. Optional adjustable headrest. • Customize Capisco to your exact needs with choices of cylinder height, footring, casters, fabric and frame colors, etc. Free shipping in continental US. Grade 1 Camira fabric in 5 colors and Black Paloma leather available for 1-2 week quick ship (Polished aluminum base and other colors, fabrics 4-5 weeks). Call 888 302 3375 for details.